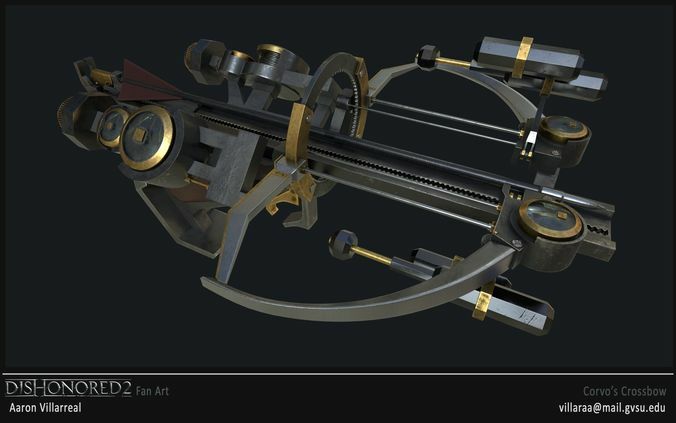 This is a replica of Corvo's Crossbow from dishonored 2. It is broken up into many pieces so you should be able to properly assemble it, if there are any issues let me know. You will have to scale it up before printing. This is slightly different than the design from the first game's crossbow. This model does not contain the bolt, that is available separately. If there are any questions regarding the model or you need any assistance after purchase, I am more than happy to assist you and fix anything that comes up. My main goal is to provide an awesome product that everyone can enjoy. The textures are not included with the stl, but it does give you an example of what it would look like if you painted it! Let me know if you are interested in the obj/textures and I can make arrangements. Great model, just keep in mind it does not come with a bolt model and isn't to scale for printing.